Make your kid happy with best-rated kids headphones available right now. Where can I find Noise Cancelling Headphones for Kids? How are Kids Headphones Different From the Rest? How effective is the volume limiter. Listening to loud music for too long damages hearing. More info in the article. Ages these headphones are most suitable for. May vary depending on your kid's head size. Jump to: Best Kids Headphone Reviews | How are Kids Headphones Different? Whether you’re looking for toddler headphones or headphones for older kids, you’ll find the best options reviewed here. A pair of good toddler headphones can be a great tool for making your little ones busy… and finally get some peace and quiet yourself. 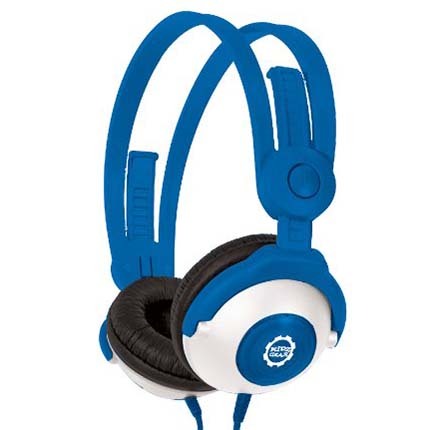 Compare various designs and types of children headphones and make the best decision right here. Unfortunately there are no kids headphones with active noise cancelling technology on the market right now. If you want to get a pair for your kids you can check normal ANC headphones here. The reason why this is so, it’s because noise cancelling technology is relatively expensive and doesn’t fit well with the kids. Keep in mind all headphones still have some passive noise isolation but it usually isn’t as effective as noise cancelling. The most obvious is size difference. Kids headphones are smaller to fit smaller heads. If headphones are too big children won’t be able to get a good fit. This means bad sound quality and uncomfortable fit that needs constant readjustment. Kids don’t like that. Toddlers have much smaller heads so they needs headphones suitable for toddler head size. Headphones for kids need to have a volume limiter. Because it’s a known fact that listening to loud music for too long can damage your hearing, keeping a restraint on volume is a must. Experts agree the volume of 85dB for 1 hour is maximum a kid should be exposed to. 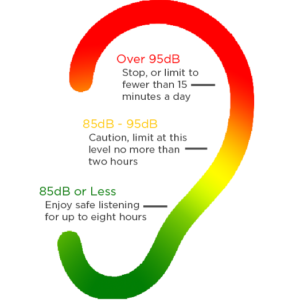 In comparison, an adult can safely listen to 85dB for about 8 hours a day. Keep in mind most normal headphones reach higher volumes at max which lowers the safe-use time even more. Little kids like the music loud but they don’t know this will damage their hearing in the long run. Hearing loss is cumulative and hard to notice. This is why most kids headphones have a volume limiter installed so it’s impossible to ramp up the volume too high. This is a great safety feature that should be used by all responsible parents. Keep in mind, even these volume-limited headphones will go louder than 85dB if you connect them to a strong amplifier. Use non-amped MP3 players and smartphones. Kids headphones need to be “tough”. We all know what kind of “destruction” kids are capable of. If toys are not made for little kids in mind they soon become small pieces of nothing. Getting headphones that will survive the hard treatment of little kids is an important factor to consider. At the same time, kids grow up fast so affordable price is another thing to consider. You don’t want to spend too much money on something that will only be used for a couple of years. Because it’s always great to have a tool you can engage your kids with picking the right design can be crucial. Headphones for adults are often bland in color, black or grey… this will hardly interest a kid. Instead, picking headphones with an interesting design for kids might just do the trick to keep the little ones busy. The best headphones for kids in our opinion! Puro Sound Labs kids wireless headphones rank exceptionally high in just about every category for a reason. They are well made, comfortable, and sound great. 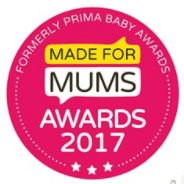 Puro’s attention to detail and commitment to delivering safe listening levels is something you and your young listener will appreciate. The volume limiter feature of the Puro Sound Labs Bluetooth Kids Headphones limits maximum volume output to 85 dB. There is no separate app or electronic setup required to engage the volume limiter since it is built in to the headphones. The volume limiter works in both Bluetooth wireless and wired listening modes. One thing you need to know for wired mode operation is that the limiter feature only works with the use of provided Puro Limiter 3.5mm audio cable. This cable works great, but only if it is attached in the right direction. There are simple instructions included to help with this. While these headphones do not have active noise cancelling electronics, the earcup and padding provides excellent passive noise isolation. The noise isolation design can block up to 82% of sound in the 1 kHz range and is effective at promoting safer listening levels. These headphones are built with an aluminum headband and earcups, so they are quite robust. Previous models used a plastic headband that didn’t hold up as well as the newer aluminum model. The earcup and headband padding is made of good quality material that is resistant to stains and is easy to clean. A hard carrying case is included to help protect the headphones when not in use. While the headphones are durable, it is recommended to use the case instead of putting the headphones directly in a backpack or bag. A standard 1-year warranty is provided. Puro Sound Labs Bluetooth Kids Headphones feel soft and plush, and they are very comfortable. The size is just right for the average child and they will even work for teens or adults with smaller head sizes. They’re great as toddler headphones and early teen headphones because of their flexibility. If your child has a larger head or if you want a pair of these headphones for yourself, consider upgrading to the BT5200 adult model instead of the BT2200 kids model. The earcups are sized so that they can fit over smaller ears or rest on larger ears. There may be some slight pressure points around the outer ear if the earcup padding presses against the ear for a few hours. What are the most comfortable earbuds? Besides the attractive and durable aluminum construction, the Puro Sound Labs Bluetooth Kids Headphones are available in a variety of colors. Color choices include modern and sleek combinations like: black, white/silver, blue, purple, and gold/tan. The earcups pivot 90˚ so that the headphones fold flat and can be stored in the low profile hard case. All controls are located on the right earcup. This makes things simple and easy. There are two buttons for volume up/down, a Bluetooth pairing button that also works as a play/pause button, and a slide switch to turn the headphones on/off. A 3.5mm audio jack and micro-USB charging port is also included underneath the right earcup. Bluetooth pairing is very easy, especially with Apple devices. The wireless range is about 30 feet (9 meters). Battery life provides a respectable 18 hours of playback time in wireless listening mode. The Puro Limiter 3.5mm cable uses a flat-style construction that is tangle resistant. The sound quality is excellent in both wired and wireless listening modes. 40mm drivers and Puro’s “Balanced Response” tuning provide rich bass and smooth treble for a pleasing listening experience. Many adults will find that the Puro Sound Labs audio quality is superior to the average set of headphones designed for kids. The attention to sound quality and safety is yet another reason to consider these headphones for your child. Puro Sound Labs Bluetooth Kids Headphones offer exceptional value for parents and kids that need a durable and attractive set of headphones that sound great, have a volume limiting feature, and provide a wireless option. Best value for money wireless Bluetooth kids headphones. Versatility and value make the LilGadgets Untangled Pro Bluetooth headphones a good option for those with two or more kids. The built-in SharePort allows audio sharing without the use of a splitter and there are several other features, more on that below. These LilGadgets kids wireless headphones are designed with an integrated volume limiter that keeps the maximum volume below 93 dB. This isn’t the lowest dB rating when compared to other headphones on this list, but it is still effective at limiting dangerous sound levels for your child. One reason for the 93 dB rating is that the LilGadgets Untangled Pro headphones provide 13 dB of passive noise isolation. This level of isolation is ok, but it isn’t high enough to block out a lot of background noise. That’s one reason why there’s a higher volume limiter. Check the most effective noise isolating headphones. Constructed with a stainless steel headband and polycarbonate earcups, these headphones are ready for an active kid’s environment. The LilGadgets Untangled Pro have survived drop tests, stretch tests, chew tests, and tangle tests to ensure a quality product that will last. A nylon coated audio cable is resistant to tangling and holds up well to moderate abuse. Some users have complained of minor tearing of the soft fabric on the earpads and headband. The weakest component may be where the earpads meet the earcups. This area can separate in some cases if the headphones are dropped too many times. LilGadgets provides a 1-year warranty and good customer support. SoftTouch padded fabric covers the earcup and headband foam, providing a soft feel and comfortable fit on the ear. The headband design is easy to adjust, with the earcups sliding up or down at the base of the stainless steel headband. Sizing is suitable for a variety of ages. While LilGadgets recommends these headphones for ages 4 and up, they can even be used by younger toddlers as well. As long as you trust them with slightly more expensive headphones. There’s video comparison of these with LilGadgets Connect+ below. The most notable feature of the LilGadgets Untangled Pro is the built-in SharePort. A 3.5mm SharePort jack is included underneath each earcup. This audio port allows multiple headphones to be connected to each other and share the same audio source. This is a very convenient option since it eliminates the need for an external 3.5mm audio splitter. This means you can connect 2 or more of these headphones to 1 MP3 or phone at the same time. Great for some group fun in the car for example. The included 48-inch (1.2 meter) nylon coated audio cable can be used as a wired primary connection or a SharePort connection. Note that the SharePort option will not work when the headphones are used in Bluetooth connection mode. Volume is controlled by a simple and easy to use slide wheel located on the side of the right earcup. The Bluetooth button and charging port are also located on the right earcup. LilGadgets provides a soft carrying pouch for basic headphone storage. Bluetooth range is around 30 feet (9 meters) and the battery will last about 12 hours. There are several bright color options to choose from, including green, pink, purple, black, and white. Overall sound quality is good and offers a frequency response that is suitable for young ears. Kid headphones don’t necessarily need sonic fidelity since kids aren’t old enough to really appreciate it. But having an enjoyable sound is definitely an advantage. LilGadgets headphones won’t win any audiophile awards, but these headphones work great for a variety of content including audio books, games, and movies. 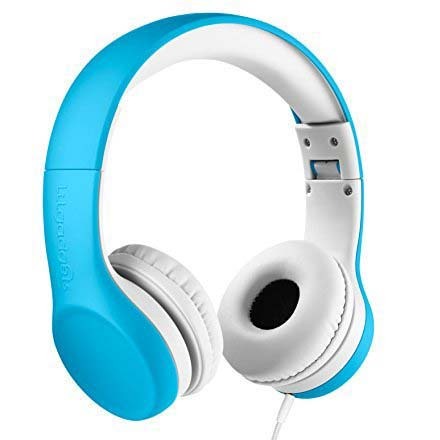 LilGadgets Untangled Pro Bluetooth headphones are available in a variety of fun colors, kid tested for everyday use, and provide the important volume limiting safety feature you need in a set of children’s headphones. Cool folding/non-folding design for an affordable price. Available in folding and non-folding designs, the Jlab Audio Jbuddies Kids headphones offer kid-friendly features like simple controls and personalization. Jbuddies kids headphones feature a volume limiter that keeps the total sound level from exceeding 90 dB. The volume limiting feature is built into the headphones and does not require a special cable or electronics. Passive noise isolation is provided with the earpads. However, the on-the-ear wearing style is not going to block out lots of outside noise. 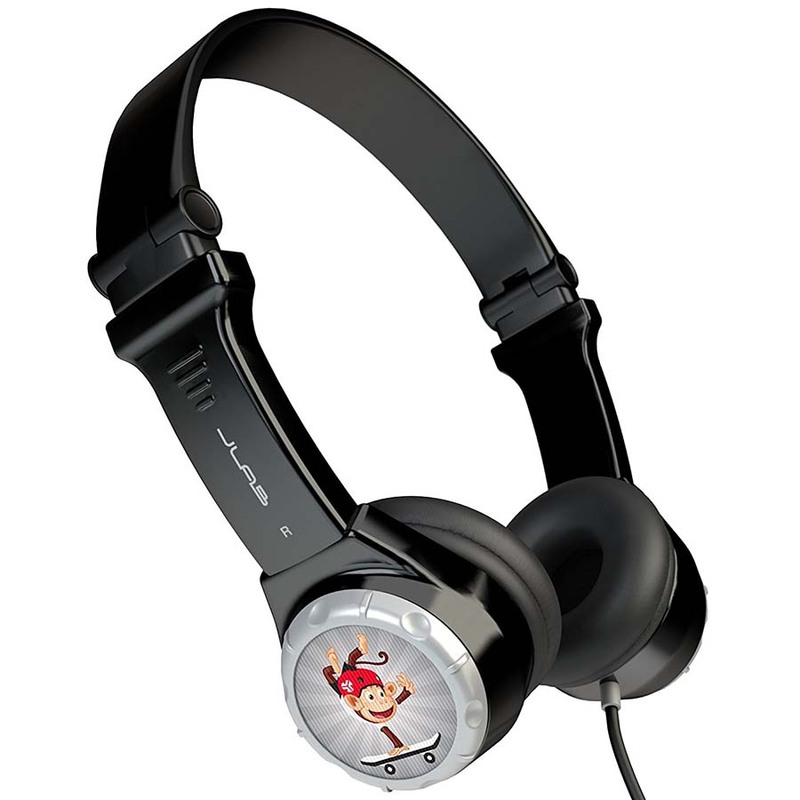 Jlab Audio Jbuddies Kids headphones are built with simple plastic and vinyl materials that provide average durability. The headband has a good amount of flex without cracking or breaking. There is a folding model available that features hinges on either side of the headband. The hinges are well-made, but can be a weak point if bent too sharply. Smooth surfaces for all of the components makes these headphones easy to clean. A soft carrying pouch is provided for basic protection when transporting the headphones. Cable strain relief is very basic and some users find that the 3.5mm jack casing can come loose or even lose connection. One very nice feature is that these headphones come with a limited lifetime warranty when you register with a valid serial number. Customer support is very responsive as well. In-ear headphones with best durability. The flexible headband design of the Jbuddies headphones is flexible to accommodate a wide range of head sizes. There is very little clamping pressure. The vinyl-covered hypoallergenic earpads are soft and easy to clean. While Jlabs suggests these headphones for ages 2+, most users find that they are suitable for children 4-14 years old. Basically, it all depends on head size of your kids. Some have bigger heads at younger ages. Younger toddlers with smaller heads may experience a loose fit around the ears at least in the beginning. But then again you don’t want a tight fit on a toddler anyways. 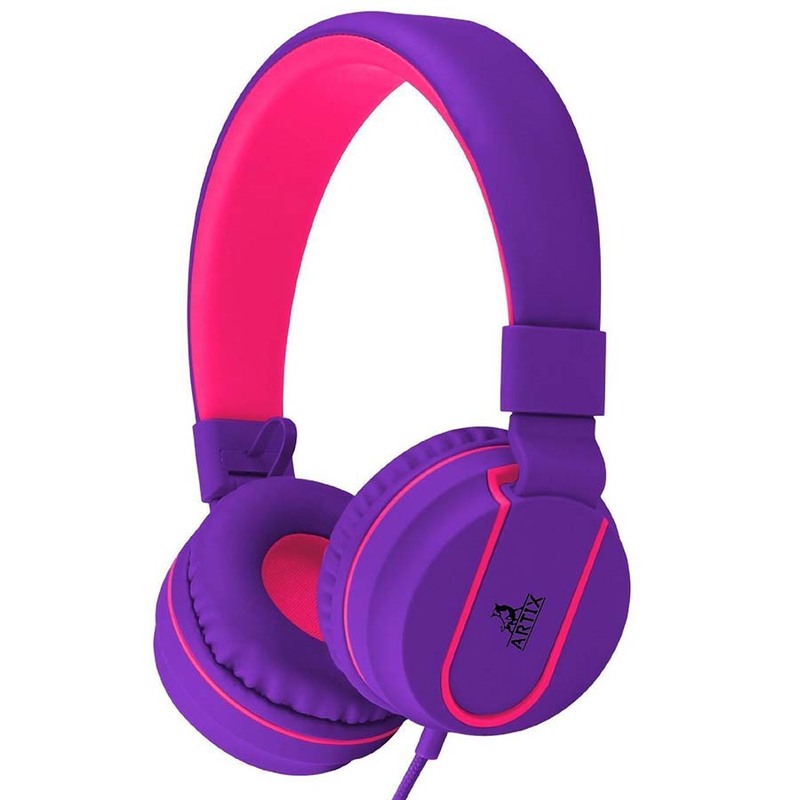 Jlab Audio Jbuddies Kids headphones are available in many color choices and combinations. This is great for families with multiple children that may want a specific color. Additional personalization is available by using the eight different 3D character stickers that are included with each set of headphones. Controlling the volume is very easy with the large dial located on the left earcup. There are two different design options: folding and non-folding. The compact folding design is available with pinch-free hinges. These are a great choice for traveling since the folded dimensions are only 5.5” x 4” (14 cm x 10 cm). Both models are only available for wired audio with a permanently attached cable. The 3.5mm angled plug may be an issue for some users with large mobile device cases that may prevent the thicker plug from plugging in through the case opening. What are top sports Bluetooth headphones? These headphones produce plenty of sound that is good for the average kid. The plastic earcup and driver design doesn’t produce a lot of deep tones, but these headphones are just fine for most users. Some parents may feel that the maximum volume level of 90 dB is too loud for very young ears, but the volume limiter is still very handy. Jlab Audio Jbuddies Kids headphones have lots of style and color, are available in folding and non-folding designs, and are a good choice for kids that need a simple set of wired headphones with volume limiting. Best value for money kids headphones! If you need headphones that fit even the smallest toddler head sizes, then you need to check out LilGadgets Connect+. For bigger kids, 6year+ check out the Connect+ PRO model here. These compact headphones come in several bright colors and they sound as good as they look. Volume limiting is important for children’s headphones, especially for younger kids. The LilGadgets Connect+ headphones will keep kid’s ears safe with a maximum volume limit of 93 dB. The volume limiter is built into the headphones, so you don’t need any special adapters or electronics to make it work. Like other headphones from LilGadgets, the Connect+ model provides 13dB ambient noise isolation. This level of passive isolation is ok, but it might not be the best for traveling on louder airplanes or using in other similar environments. Having a hinged headband design allows these headphones to be compact, but it can also be a weak point in the construction. Most users experience great durability with the headphones, except for the hinge section that can break if the headphones are twisted too much. The audio cable of the LilGadgets Connect+ is covered with a braid nylon coated fabric and is quite robust. A soft microfiber carrying pouch is offered to help protect the headphones when they are not in use. One nice thing about these headphones is that there are no controls along the outside of the earcups that can break and go bad. A standard 1-year warranty is provided and LilGadgets has a reputation for providing great customer service if you have any problems. Do you like playing games? See top gaming headsets here. These headphones are perfect for smaller head sizes. Kids from 2-8 years old should be able to find a great fit within the adjustable headband range. LilGadgets Connect+ are reasonably lightweight. They also feature good padding on the headband and earcups. The hinges in the headband use a pinch-free design to ensure that hair and clothing do not easily get in the way of the hinge. If you have multiple kids that want to listen to the same audio source, then you’ll love the SharePort feature that is built-in to these headphones. Each set of headphones comes with a 3.5mm jack underneath each earcup. This allows you to plug in one device to the source (MP3/smartphone) then connect additional headphones to the first device for some group music fun. The 52-inch (1.3 meter) audio cable is longer than most cables from other manufacturers. The longer cable allows for more convenience when your child is seated farther away from a playback device. LilGadgets Connect+ do not have a built-in volume control, but the volume limiter circuit will stop at 93 dB if a device is turned up. Fun and kid-friendly headphone colors include blue, green, pink, purple, and black. With so many great features for a price point under $25, these headphones are definitely a good choice for the value-savvy buyer. For such small headphones, the Connect+ sound pretty good. The 40mm drivers are plenty large enough to provide full-range frequency response. There’s even some bass and generally sound better than many adult headphones. Designed for young children and those with smaller heads, the LilGadgets Connect+ provide good volume limiting control in an attractive package that is fun for kids and a great value for parents. The safest kids headphones with 3 level volume limiter & lots of other features. Onanoff Buddyphones Inflight headphones pack a lot of great options into one compact product. With features like a folding headband, 3-step volume limiting, and an integrated sharing port, these headphones might be a great option for traveling families. Loose fit for smaller toddler heads. The unique feature of these Onanoff Buddyphones Inflight headphones is that you can select the maximum volume level for your little listener. There are three volume limiter settings that are user selectable: 75 dB, 85 dB, and 94 dB. You may want to use the highest setting (95 dB) for traveling on airplanes, and use the lower settings for quieter listening environments. A tamper-resistant dial on the earcup allows you to change the setting. The dial can be tricky to operate, so be patient when you use the 3-step volume limiting function for the first time. Buddyphones Inflight headphones have a very flexible and durable headband that can twist, turn, and bend without breaking. The construction quality is generally pretty good and the components hold up to a fair amount of use and abuse. Hinges are included as part of this Buddyphones Inflight model. As with most headphone hinge points, these can crack when twisted or stressed too hard. Some users have reported that early models where shipped with faulty components, but the company is very responsive to fix any issues. The adjustable headband provides a comfortable fit for a variety of head sizes. Earcup and headband padding is good, but isn’t as plush as some other headphones on this list. 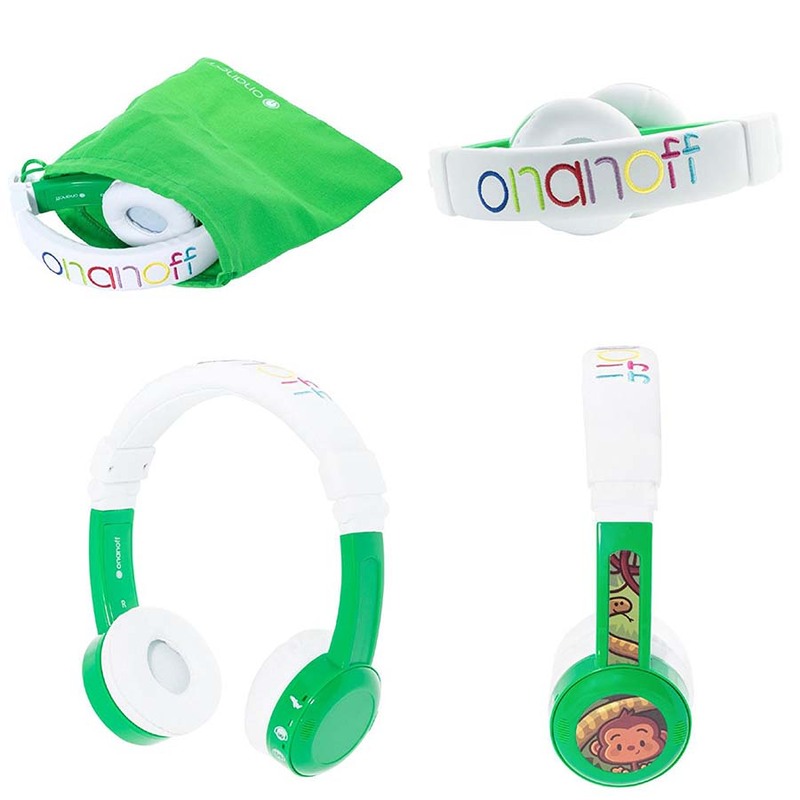 Onanoff Buddyphones Inflight headphones are recommended for kids ages 3-10. The one drawback for comfort is that kids with smaller heads may find that the flexible headband doesn’t fit very tight. There are several other great features included besides the 3-step volume limiter. A tangle-resistant flat audio cable is provided to match the color combination of the headphones. The cable is a bit shorter than other wired headphones, coming in at only 31.5 inches (0.8 meter). An integrated 3.5mm audio splitter is included on one end of the audio cable. Up to four Buddyphones can be connected through the same audio device. However, if you have a mobile device with a thick case, the cable and splitter connector combination may not fit all the way through the case. The Onanoff Buddyphones Inflight headphones model is the premium version in the Buddyphones series and it includes the most options and accessories. Their foldable design makes them very compact, and the included airline audio adapter makes them great for air travel. Total folded dimensions are 4.3 x 5.9 inches (110 x 150mm). An in-line microphone with a play/pause/call button is another handy feature that other kids headphones don’t always have. The color designs are very playful and there are six sets of decorative stickers for extra personalization. Buddyphones are good for most listening needs, especially when listening to movies on airplanes. Other airplane friendly headphones. The frequency response of the 30mm drivers is reasonable, but you won’t get a lot of booming bass. One thing to note about the sound is that you probably won’t want to share the audio splitter with different types of headphones. This can cause some volume differences with the other brand, so try to use only Buddyphones headphones with the built-in audio splitter. If you want the best control of the maximum volume for your kids, then the Onanoff Buddyphones Inflight 3-step volume limiting headphones should be your top pick. Cheap, comfortable volume limited headphones, perfect backup pair. An extra-lightweight design makes these Sony MDR-222KD Children’s Headphones easy to wear all day. These headphones will work well for kids and adults alike, but the volume limiter may work too good for some users. More details below. The volume limiter function is a basic resistor included in the Sony MDR-222KD’s cable. The volume limiter definitely works, but it almost works too well. These headphones will not be good for traveling on airplanes or when using in a noisy environments. The cable is permanently attached, so you can’t change out the cable or bypass the volume limiting setting. However, listeners using these headphones in quiet areas will probably be satisfied with the maximum volume level. There is very little passive noise isolation, which also means there will be some sound leakage. You may be able to hear what your child is listening too. Take a look at active noise cancelling earbuds for air travel. The lightweight design is mostly due to the thin plastic headband. While the construction is flexible and the plastic is decent quality, these headphones could be broken in a playful tug of war or other common strain when travelling. Cable strain relief is minimal on the single cable entry to the earcup and at the 3.5mm jack. The foam earpads can also tear apart with too much use, but replacements are readily available. The overall quality and durability are ok, but not great. Using these headphones around the house should be no problem. You’ll just want to be careful when taking these headphones out of the house and subjecting them to the typical stress and strain that can come with travelling. You should also know that there is only a 90-day warranty period from Sony. This is much shorter than the typical 1-year warranty offered by other brands. Sony MDR-222KD Children’s Headphones are certainly comfortable. At only 1.84 ounces (52 grams), these are some of the lightest traditional headphones on this list. The earcup and headband design make these a great choice for long listening sessions and for use in hot environments. Sony recommends these for kids 8 and up, but the MDR-222KD will also fit plenty of other head sizes, including adults. The headband is easily adjustable so that the earpads rest gently on the ears without a lot of clamping pressure. The lightweight style also means that these headphones won’t make the ears too warm or sweaty. Aside from the two color options of black and pink, there really aren’t very many options to choose from. 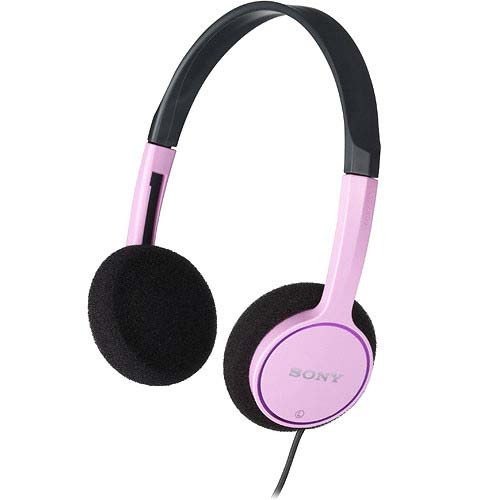 The Sony MDR-222KD Children’s headphones come with an attached 47-inch (1.2 meter) cable that includes the restrictive volume limiting circuit. Basically they require really high impedance to drive them. This means they will be much more silent with smartphones, tablets and MP3s. The flexible headband and on-the-ear earcup size works great for most head sizes, from toddlers to adults. These really are a versatile set of headphones in that respect. While it is easy to look beyond some of the minor product flaws noted earlier, sound quality could be another matter for you. These headphones tend to be a bit muddy. It could be due to the resistance of the volume limiter circuit or the smaller headphone drivers. They might work fine for your child if they don’t require a lot of full range audio and deeper bass in their headphones. Sony MDR-222KD Children’s headphones might not compare to the best volume limiting headphones available, but they are a great backup pair that is comfy and cheap. The best alternative to classic headphones for kids. Are you looking for an alternative to traditional kids headphones? 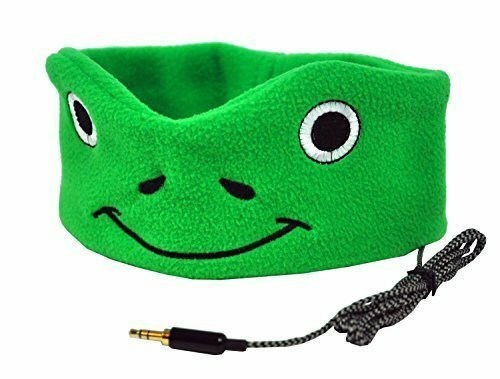 If so, the CozyPhones Kids headphones headband might be the perfect solution. These headphones are ultra-compact and very comfortable. Probably the best headphones for toddlers with their simple and durable design. Volume output of the CozyPhones is good, and it could even be too loud according to some parents. The company states that the volume limiter is set to keep the headphones from exceeding 85 dB. However, volume output of some headphones seems to be slightly higher than that in certain cases. This is likely due to how powerful your music device is. Since the headband can completely cover the ears, it does a good job of blocking out some ambient noise to let your child focus on what they are listening to. There isn’t much to worry about with these headphones when it comes to durability. The adjustable headband is made from a soft fleece fabric and the thin headphone drivers can be removed. These detachable headphones, along with the cord, allow you to wash the headband whenever you want. A braided audio cable makes the design robust as well. All of these features make the CozyPhones Kids Headphones headband perfect for compact travel. You won’t have to worry about a special case or folding these headphones. CozyPhones also provides a 100% satisfaction guarantee in case you need to process a return or have a question. Very soft fleece and an adjustable headband make these headphones extremely comfortable. The headband adjustment range is good for children ages 1 and up. If your child doesn’t like over-the-ear headphones or earbuds, then the CozyPhones Kids headband is going to be one of your best options to try. These headphones have been known to work for kids with sensory issues and SPD (Sensory Processing Disorder). It’s also very easy to pull down the front of the headband to use as a sleep mask. And because they are so thin, it’s easy to wear the headphones while sleeping. A very secure fit is achieved once the headband is properly adjusted. These headphones will certainly stay in place, even on an active toddler. One drawback of these headphones is that the fleece material can get hot. If you live in a very warm climate, you may need to be aware of that comfort issue. Perhaps the most impressive component of the CozyPhones Kids headband is how thin the speakers are. They are only 1/8” (0.31 cm) thick and they easily slip into the headband. Adjusting the headband and speakers is very easy and it should be simple to get your child fitted quickly. A long 52-inch (1.3 meter) audio cable attaches to the headphones and is compatible with any standard audio playback device. Besides being lightweight and compact, these headphones are also a favorite pick for kids. There are several fun designs to choose from, including Blue Unicorn, Fox, Purple Frog, Panda, Green Monster, and Kitten. Like wireless Bluetooth headphones, click here. The ultra-thin speaker does a good job, but it can lack some bass presence simply because it is encased in fabric. Honestly, the CozyPhones Kids headband is more about comfort, playful design, and a secure fit than sound quality. Which is exactly what kids like. The can’t be a lifesaver when traveling with young children. CozyPhones Kids Headphones headband offers parents and kids a fun, unique, and comfortable product that is perfect for travel, bedtime stories, or for kids with sensory issues. Cool looking over-ear headphones for kids without volume limiter. Artix Headphones for Kids look, sound, and feel like a high quality set of headphones. They just happen to come in fun colors and a great size for kids! There are plenty of quality features to explore, so let’s dig in. Perhaps the biggest downside for these headphones is that there is no volume limiter feature. You can find a variety of volume limiter cables or adapters to use with the factory cable, but these Artix headphones do not have that feature built-in. However, passive noise isolation is very good. The padded foam and insulated plastic earcups really help dampen harsh outside frequencies. This means that your child won’t need to turn up the volume very loud to have great sound. The physical design of the Artix Headphones for Kids is stylish and sturdy. A folding hinge above each earcup allows these headphones to be fairly compact, even though the earcup design is slightly larger than other headphones on this list. The hinge design is robust and is able to stand up to everyday use without a problem. A braided audio cable is provided with an angled 3.5mm plug. Strain relief for the cable is excellent at both ends. The audio jack fits solidly in the playback device and doesn’t cause any crackling or intermittent sounds that can happen with some cheaper headphones. The one minor flaw and weakest point in the design is the exposed headphone cable near the hinges. This cable can sometimes get caught or strained if you’re not careful. Only a few users have noted one side of the headphones not working, so this is pretty minor. Artix provides a 1-year warranty and their support department is based in USA. Love bass? Get top basshead earbuds. Artix Headphones for kids rank high in comfort. The ear cushions are very soft, resting gently over the ears. The headband has good cushioning, but it isn’t too bulky like some headphones can be. Weight is average for over-the-ear headphones, so these are suitable for long listening sessions. Size is adjusted by moving the earcups up and down on the very end of the headband. This type of adjustment style works well for average head sizes, but it might not be great for very young kids with smaller heads. That said, the headband is narrower than normal headphones, so these are a comfortable option for most kids 3 and up. Available in a variety of colors, Artix Headphones for Kids are sure to please any young listener that want a quality product to look good too. Colors included blue/green, olive green, orange/black, pink/blue, purple/pink, and light turquoise. The braided audio cable includes an in-line microphone with a multi-function button for play/pause and call answer. The multi-function button works with most playback devices, but there is no remote volume control option. Which is probably for the better. You can only control the volume at source and your kids can’t change it on headphones. These Artix headphones are great for travel since they fold into a compact package. A case is not included, so you’ll need to get that separately if you want one. For headphones in the $20-30 price range, these stylish cans for kids actually sound pretty good. Highs are clear and the bass is nice and strong. The quality ear cushions block out a lot of outside noise so you can focus on what you’re listening to. If you’re not worried about volume limiting technology for your child’s headphones, then Artix Headphones for Kids are a great option. Durable, sound great, and look like fun all for a low price. Flexible over-ear headphones for kids with effective volume limiter. The classic split-band design of the Kidz Gear wired headphones makes these over-the-ear headphones a great lightweight choice for traveling kids. Passive noise isolation and volume limiting are included to help protect your child’s hearing. Check out the rest of the details below before purchasing. A volume limiting cable adapter is provided with the Kidz Gear headphones. This allows you to use the limiting technology when you need it for everyday listening and then remove it for special instances, like traveling on airplanes. The limiter will effectively reduce the overall volume by about 20%. This delivers a maximum volume of roughly 80-90 dB. Note that the manufacturers specifications are not very precise for the limiting circuit. The limiting function works quite well, but there is some slight variance in the response of each volume limiting adapter. Ambient sound isolation is great. The soft earcup padding and larger earcup size does a good job blocking outside noise. Most of the components of this simple headphone design hold up well under normal use. The two-part headband is flexible and tough. There are no audio wires to worry about pinching or breaking in the headband since the wires enter the bottom of each earcup. Earcups are attached to a curved plastic slider that can adjust the size. This sliding piece seems a bit overwhelmed when it is fully extended, but it’s not too big of an issue. The cable strain relief is good and the cord stands up to the normal types of twisting, kinking, and winding that kids can do. One of the cheaper components of the design is the 3.5mm audio plug. Several users have complained of the tip separating or breaking off inside of a device. While this should never happen under normal care for any audio device, you may need to be a little more careful when plugging in or unplugging these headphones. Kidz Gear provides a limited lifetime warranty, so they do stand behind the quality of their product. It’s important to have a lightweight design for children’s headphones, especially if a kid wants to wear them for extended periods. 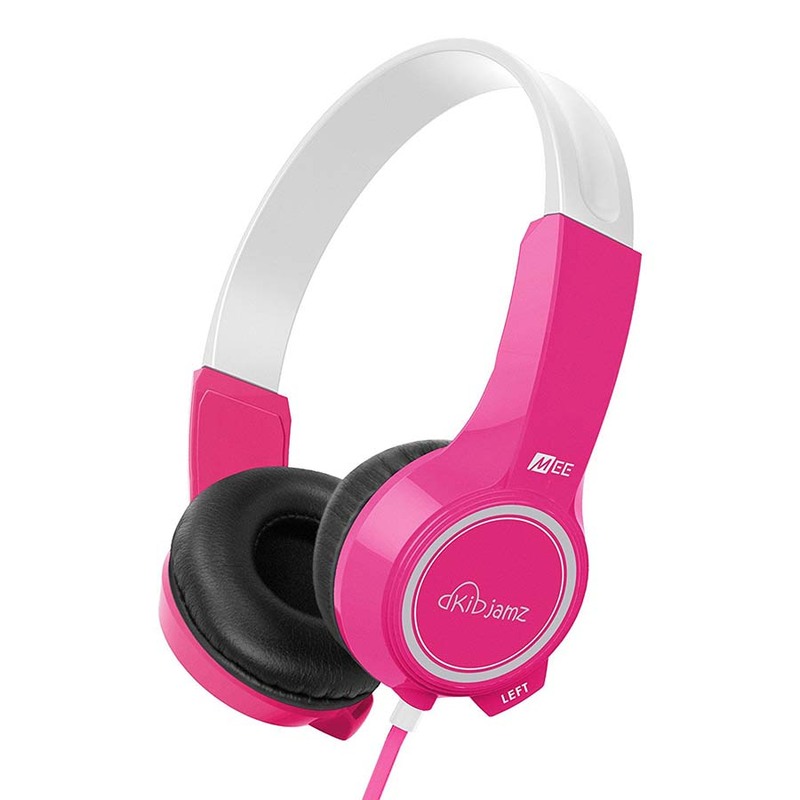 Kidz Gear headphones feature a great lightweight design. The open and split-style headband isn’t bulky at all, and it spreads out the weight across the top of the head. The large earcups have very soft padding. They also have a good pivot range that provides a reliable fit for all ear sizes. Range extension on the earcup/headband adjustment is good. It provides a wide range of wearing sizes. These headphones are suitable for kids age 2 and up, but you may find that young kids with smaller heads will experience a looser fit with these headphones. Besides the simple and lightweight design, these headphones also come with an in-line volume control. The volume control works with most standard playback devices. As mentioned earlier, the volume limiting cable adapter is optional and can be added or removed whenever you like. The main audio cable is a Y-cable design that splits and enters each earcup. This can make the cable more prone to tangling. 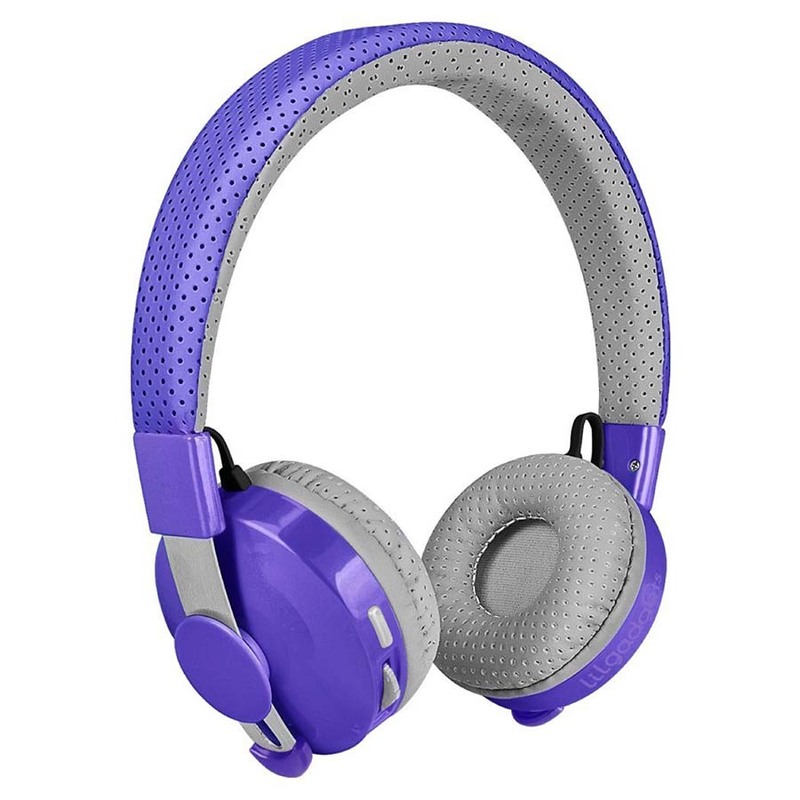 Kidz Gear headphones come in several colors that include blue, green, grey, orange, pink, purple, and white. A carrying case is not included, but they will easily fit in a soft pouch or bag. The passive noise isolation helps keep the volume low and allows for better sound quality than you might suspect from headphones under $20. All kids should be more than happy with it but it’s nothing special compare to adult headphones. These headphones are great for playing music, movies, games, or audiobooks. Kidz Gear headphones are one of the best headphones for kids if you need a lightweight volume limiting solution for kids that travel or tend to be rough on their headphone. The most durable kids headphones with volume limiter switch. MEE Audio KidJamz KJ25 Safe Listening headphones are the clear winner when it comes to a budget-friendly set of headphones. The ultra-flexible headband and low profile design are just a few of the features that make these volume limiting headphones great for kids. The built-in volume limiter circuit works great at keeping the maximum listening volume at 85 dB. Parents will especially like the hidden switch that allows the volume limiter to be turned on or off when needed. This is a great option for traveling on airplanes when it can be necessary to bypass the limiting feature. MEE Audio KidJamz KJ25 Safe Listening headphones have earcups that rest on the ear, so there isn’t a lot of ambient noise isolation it’s just average. One feature that makes these headphones such a great value is that they are very durable. The headband is made with a super-flexible rubberized plastic material that can be bent in just about any direction without breaking. Headband adjustment slides go inside of the upper headband. This makes them very discrete, simple, and easy to use. Moreover, the audio cable is also reinforced for added durability. The strain relief on both ends of the cable is equally robust. Furthermore, ear cushions can be pulled off somewhat easily, but replacements are available from MEE Audio. Soft vinyl-covered earpads rest gently on the ear for a comfortable fit. Additionally, there is a modest adjustable range for the headband. Recommended ages are for kids 4-12. A low profile design keeps these headphones from feeling too bulky or making ears too warm. The size for the MEE Audio KidJamz KJ25 Safe Listening headphones runs on the small side, so these won’t be suitable for older kids with larger heads. These headphones for kids come in three color choices: Pink, Blue, and Black. You can upgrade to the model with a microphone and in-line volume control for just a few dollars more. The reinforced audio cable uses a straight 3.5mm plug with good outer reinforcement that attaches underneath the left earcup. Note that the thick outer cover of the audio connector may not fit through all mobile device cases. Small tabs on each earcup provide clear labeling for the left and right sides to help train your child to use the correct stereo imaging. The volume limiting switch on these headphones is certainly a handy feature that many other brands don’t offer. Even though the headphones are not bulky, they won’t fold into a smaller package. However, they will be plenty durable to throw into a handbag or small pouch when traveling. Moreover, the headband, earcups, and vinyl earpads are easy to clean which is always important. While you do get a Safe Listening guide with the headphones, there aren’t any other frills to expect with these low-cost headphones. But what you do get is a long-lasting set of kid’s cans for a great price. Mee Audio does a good job of producing low cost headphones that sound great for the price. These KidJamz KJ25 headphones are no exception. Sound quality is great for all kinds of kid’s music and movies, and the small earcups and drivers deliver an enjoyable listening experience. If you want the most durable kids headphones for under $20, then you definitely need to check out MEE Audio KidJamz KJ25 Safe Listening headphones with their flexible design and volume limiting switch technology. What do you think about these kids headphones? Have you gotten a great pair for your kids? We want to know about them. Share in the comments section below.